Dion von Moltke is used to defying gravity. As one of the drivers of APR Motorsports’ $450,000 Audi R8 LMS car, the international business student is used to going ’round a racetrack at speeds that reach almost 200 miles per hour, pulling 4 to 5 Gs at every turn. The rest of the time, though, von Moltke, 21, is a fairly typical FIU student who fits the quintessential profile of a Panther. His heritage is international (although American-born, his family is South African). 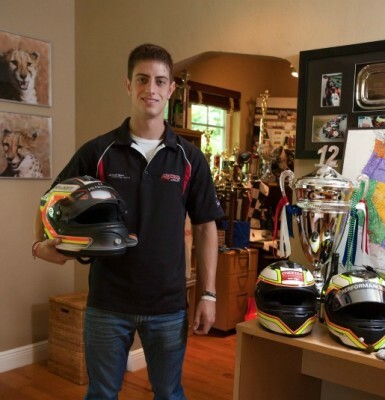 He’s a junior in the College of Business Administration, balancing school work with what is shaping up to be a promising professional racing career. And, like most of his peers at FIU, he drives a pretty nondescript car – a white, four-door Golf GTI. Except, unlike von Moltke, most Panthers haven’t competed in some of the world’s most prestigious racing series, like Skip Barber or the American Le Mans (the GTI is a souvenir from that race). Last year, he finished 9th in the Grand-Am Rolex Daytona 24 Hours, in the No. 18 Porsche GT3 car, and this past spring, he and his teammates came in first in the GTC class at the 12 Hours of Sebring. That trophy has a plum spot among the different, feat-chronicling awards vying for space in his Coral Gables bedroom (everything from Little League trophies to those earned from behind the wheel). Von Moltke has been in the racing world for about eight years, though. It was his father who, unbeknownst to him, first put him on this exciting and promising path. His family (dad works in the airline software industry, mom is a homemaker) moved around quite a bit when he was younger – von Moltke was born in Texas and lived in Sydney and Los Angeles before his parents settled in the Magic City about a decade ago. This was pre-Facebook, so von Moltke wasn’t thrilled about having to make new friends again. Von Moltke has accomplished much of his success while attending FIU part time, via online classes. His ultimate destination? Worldwide name brand recognition. The young athlete wants to become South Africa’s next big import, like the actress Charlize Theron or the golfer Ernie Els before him. He wants to promote racing as a serious sport, as well as his homeland as a tourism destination. Earlier this summer, he announced a partnership with PR Newswire, Pyrathiroid.com, South African Airways and APR to lead a 10-day adventure tour of South Africa after the 2012 Grand-Am Rolex season ends. Clearly, von Moltke isn’t lacking in personal drive. A glance at his nightstand reveals interesting reading-material choices that may be sourcing for inspiration, including Losing My Virginity, entrepreneur Richard Branson’s autobiography, and John C. Maxwell’s The 360 Degree Leader. A Book of Beer Pong, a gift from his folks, and a colorful sombrero left by a friend, are a couple of the few tells that the athlete is, in fact, 21. In the meantime, he will continue to devote the rest of his time to giving back to the community (he’s worked with Best Buddies International) and to his studies. He says he is thankful to FIU for having a program he can build around his training schedule, racing and his entrepreneurial efforts, which include a rigorous fitness program. “This year is a make-or-break year for me, so having a good support team definitely has been good for me,” said von Moltke, who joined Pi Kappa Phi to help him stay connected to a constant group of friends. “I’m out there making a name for myself, and FIU is absolutely helping me build my brand – it’s given me a lot of information I can use while I do that. I’m a great fan of von Moltke! Thanx a lot FIU for providing this article!